Last month, I highlighted a potential topping pattern in the S&P 500 that I thought had a reasonable chance of playing out in 2019 (Scenario 1 below). Stock markets often make head-and-shoulders peaks, where the right shoulder forms a lower high before rolling over, as the market finally runs out of buyers. Over the last four weeks, equity markets have continued their run higher but the pattern is still in play. We are not far away from the S&P 500 making new all-time highs but the potential remains for stocks to roll over from here and a more severe correction to commence. Relative Strength and Momentum indicators are showing a negative divergence, making lower highs and lower lows. Zooming out, the December 2018 decline did quite a lot of damage to the longer-term chart. Support lines that have been in place since 2009 were broken, a negative development. 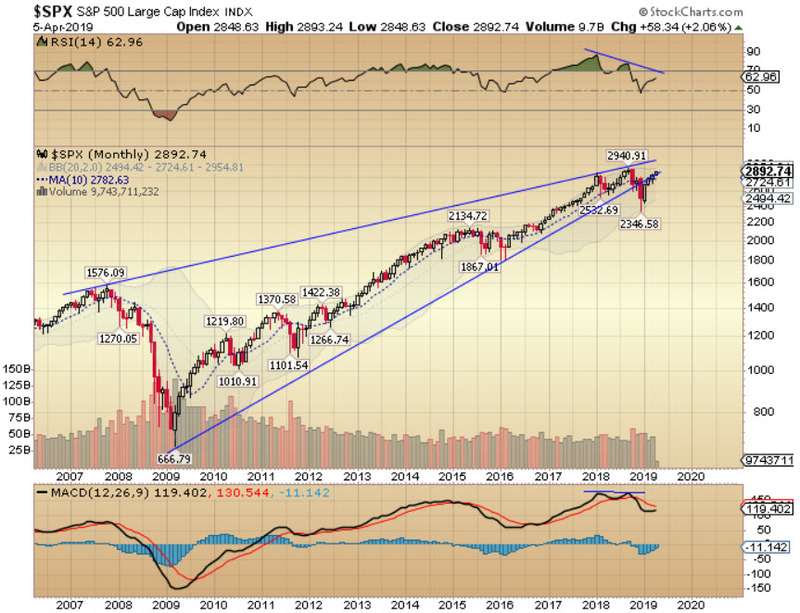 The sharp rally that took place in Q1 2019 has recouped much of the decline but has so far, just rallied back to test the underside of the decade-long support trend line. We will find out shortly whether stocks are about to kick off a new leg of this 10-year bull market or whether a bear market is about to begin.